Possibly the best view in the city of Winnipeg. This is the sunset/sunrise/Forks/downtown view - all from the same spot in your living room. Have you ever seen a bald eagle soar past the same level where you're standing? This condo comes with everything you need: 2 bed, 1 bath, upgraded kitchen, hardwood floors, extra storage closet, heated underground parking, heated swimming pool big enough for laps, a free exercise gym and party room, outdoor patio area with patio furniture and new gas bbqs, all with reasonable condo fees which cover all your utilities and cable tv. 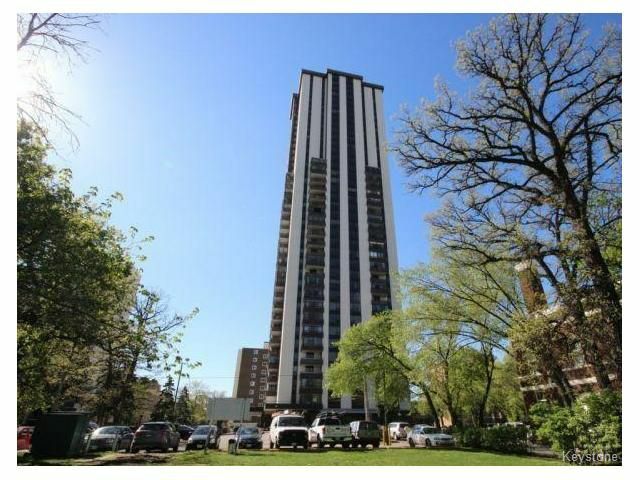 , a large reserve fund, no restrictions on pets or renters, 3 quick elevators, excellent management, convenient location in Osborne Village, easy walking distance to Safeway, Starbucks, downtown or Wellington Crescent. Call the Osborne village condo expert realtor today!